If you’re looking for a kitchen color scheme that’s both warm and cool at the same time, the blue and brown combination is probably on the table (pardon the pun!). Brown brings to mind nature, earthiness and a calm atmosphere. Blue echoes the sense of tranquility, adding a more sky-like, almost spiritual feel. And the two can work very well together in any kitchen. When it comes to the kitchen area, brown is often found in wood, or wood-like, cabinets and/or countertops. Blue shades fit perfectly almost any other place and can be used on the walls or to provide accents. 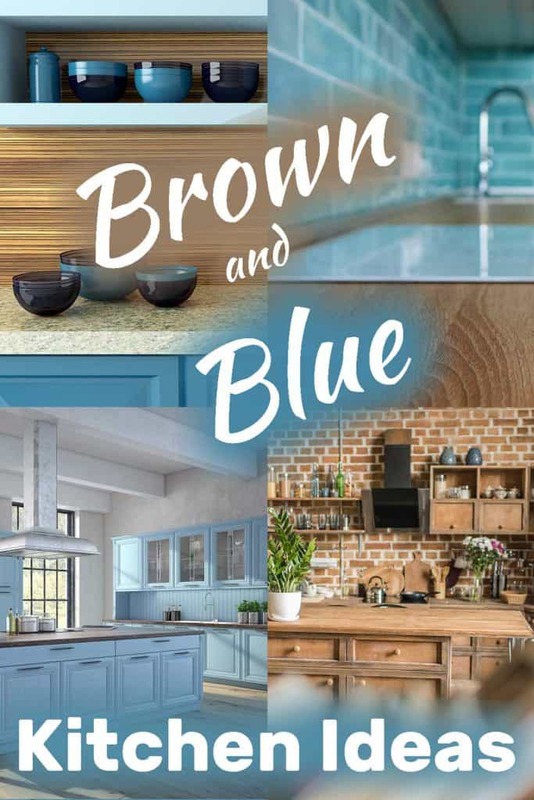 Let’s take a look at 23 Gorgeous kitchens that combine shades of brown with hues of blue into a fantastic cooking and living environment. A great example of a large spacious kitchen with baby-blue cabinets that go well with wood countertops in light brown. The countertops echo the gorgeous wooden floor, creating an overall peaceful and harmonious look. This open kitchen layout brings together beige countertops with slate blue cabinets. Sharing the space with the living area, you get a lovely mix of industrial metal elements in the lighting, as well as a modern traditional living room furniture. We love how this kitchen achieves an appealing rustic-chic look in such a small space. The most prominent design element is the country/industrial wall of exposed reddish brown bricks. It matches the dark blue cabinets perfectly. 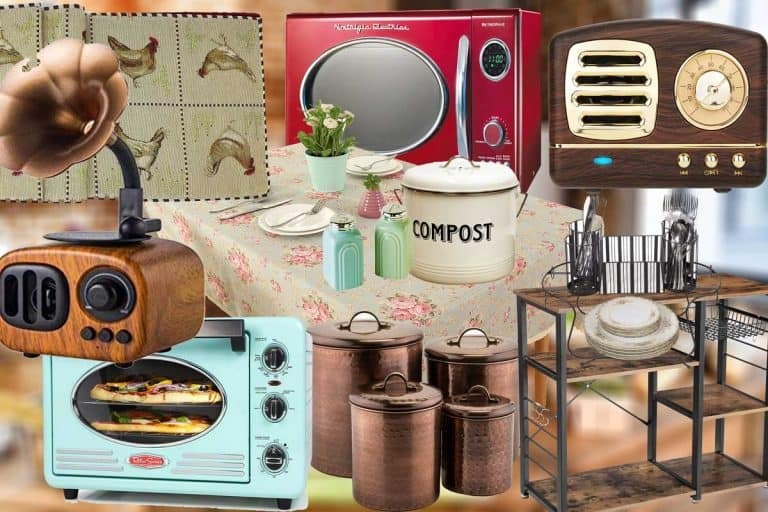 Throw in modern bar stools and lighting elements and you have yourself a small eclectic kitchen with TONS of character! A simple section of a kitchen, showcasing the color scheme very well. Note the granulated countertop surfaces, with hints of slate blue embedded in soft creamy brown. 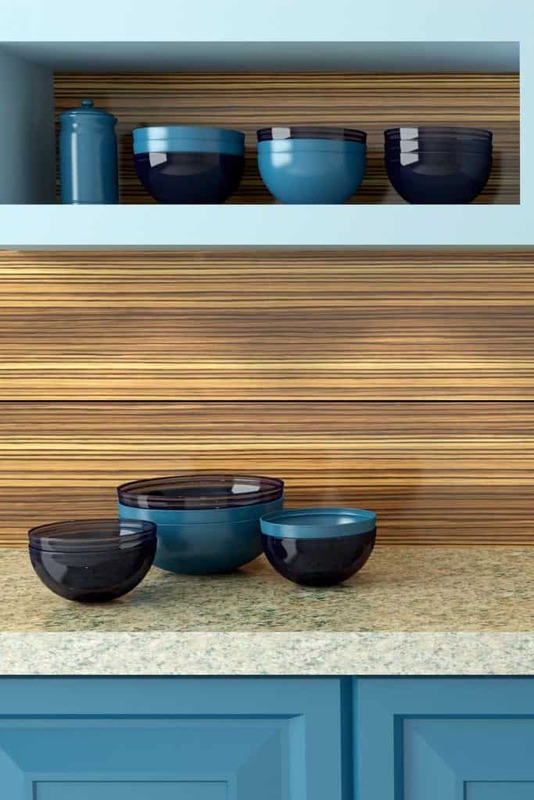 Brown and blue really go into play in the choice of wallpaper and decorative bowls. This picture is a great example of mixing in the natural element of wood in a modern looking kitchen. The basic kitchen design is white, with a huge island in deep blue. Throw in awesome mid-century modern bar stools made of real wood and you get a winning brown and blue contrast there. Blue and brown can offer contrast too. Navy blue can be nearly as dark as black. Combined with maple flooring, you get a gorgeous contrast of dark and light in a unique interior design plan like no other. Tiles are always a great way to introduce blue into a kitchen. In this case, a combination of blue and white tiles creates an exotic look and feel to an otherwise conservative kitchen. Another kitchen that shares an open layout with the living area. Here, a deep blue island echoes the blue living room sofar, for a unified look. The effect is enhanced by the gorgeous shared wooden floor in deep brown. The industrial style of design is often identified with dark spaces and the use of concrete and other dark gray elements. While there’s plenty of industrial gray here, the kitchen retains its unique identity by mixing blue and brown in other areas. We loved the bold massive wooden countertops used in this u-shaped kitchen to cover a large array of dark blue cabinets. The blue theme is continued in the beautiful floor tiles as well. Brown is a popular color in kitchen design. 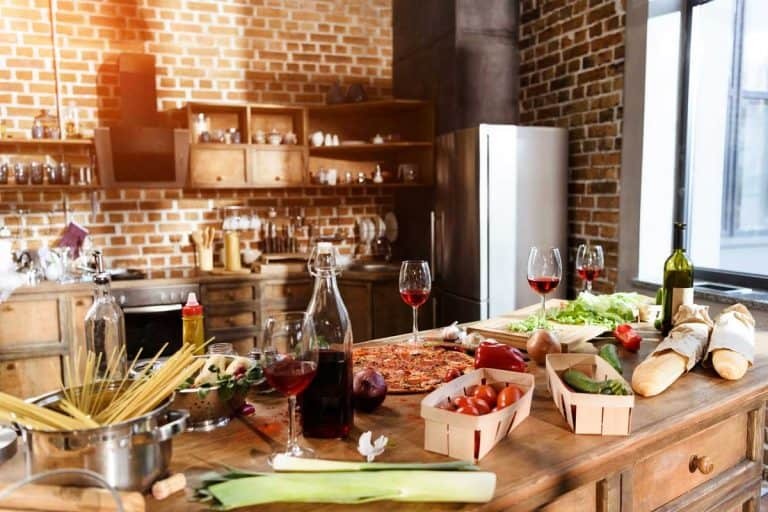 This photo shows a mostly all-brown kitchen, with lots of wood, as well as an exposed reddish-brown brick wall. 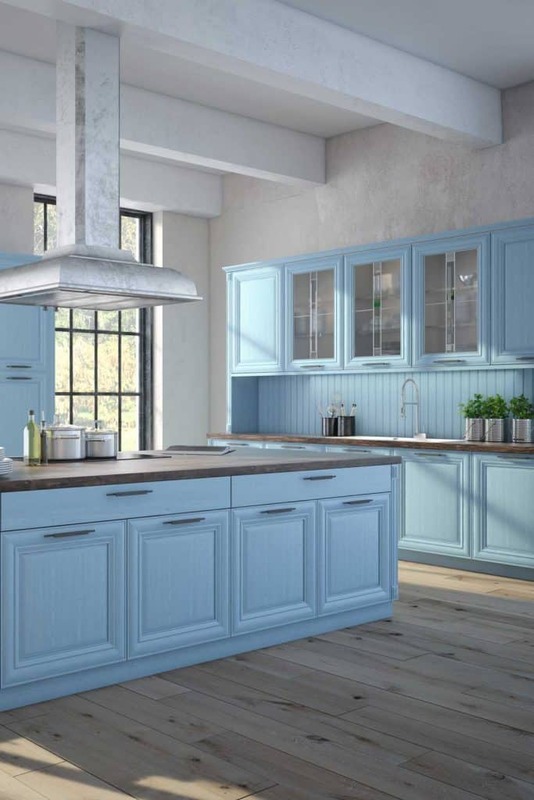 Note those two bluish gray decorative items on top of the top cabinet – sometimes that’s all it takes to introduce a blue element into your kitchen design. We mentioned blue flooring earlier but blue is also a classic color for wall tiling. This kitchen comes to life with vibrant light blue tiles “flowing” across the wall between above the solid wood brown countertops. Here too, the wall provides the blue touch – but with actual wall color rather than tiles. 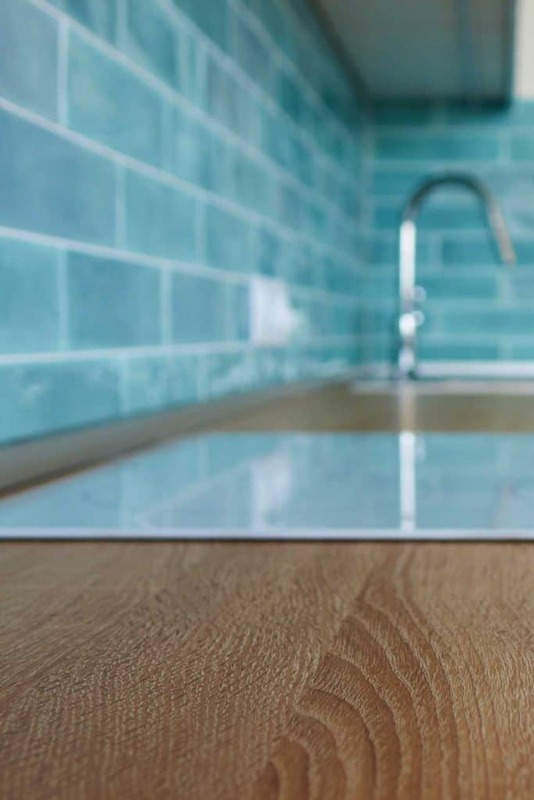 This hue of almost-teal brings life into what could easily otherwise be a dull brown kitchen. Nordic designs are all about open and well-lit spaces with generous use of natural material. 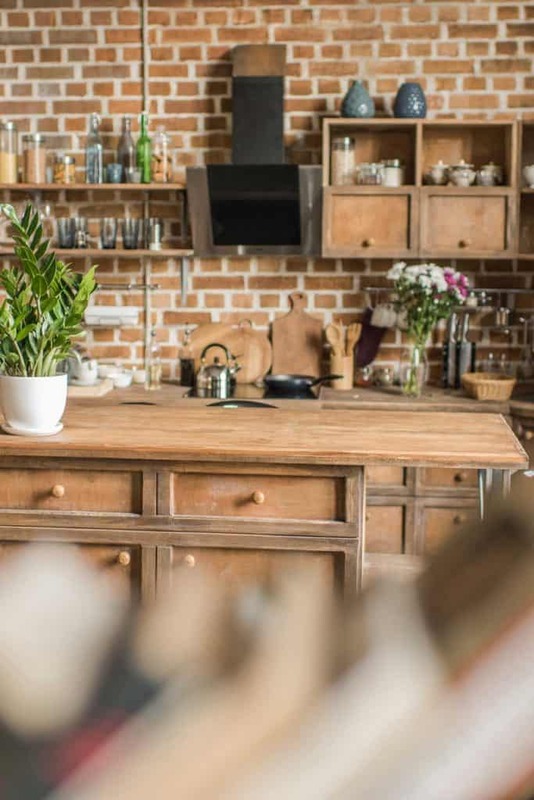 In this case, wood for the door, flooring and kitchen countertops add both the natural touch as well as the brown color. It’s beautifully matched by vibrant blue kitchen cabinets. And a single bright yellow lampshade makes this kitchen even more cheerful! Mixing light shades of blue in the cabinets as well as the tiles above the countertops is key in this kitchen design. The brown comes from the gorgeous wooden window frames, as well as the flooring. Here too, the brown comes from the accents – not as the basic color. The wooden floor and countertops are matched by two simple woven baskets. They all stand out as they contrast with the dark blue kitchen cabinets. A clean and well-lit design brings together modern looking light-blue cabinets with some light-brown wooden elements. Combined with plenty of white and a few black accents, we get a gorgeous modern kitchen. A wonderful balance of blue tiles, white kitchen furniture, and brown shelves creates a practical kitchen that invites you in to cook and live in. Blue and brown kitchens usually add only neutral shades to the overall color – either white, gray or black. In this case, the designer decided to go with green elements as well! Note the pallet-based kitchen island which creates a very hip modern look with plenty of rustic chic too. A kitchen you can get into and start cooking your favorite meals! Light blues and browns and a spacious clearly defined working area, along with a place for your guests to sit and start digging into the food! What a gorgeous example of retro 1960’s design in brown and blue. Note the chick retro bar stools, the chevron wooden floor and that gorgeous shade of blue! One last example – a blue kitchen island that creates a lively working area in an open layout. This is clearly a kitchen people live in and love! We hope you enjoyed our tour of brown and blue kitchen designs. 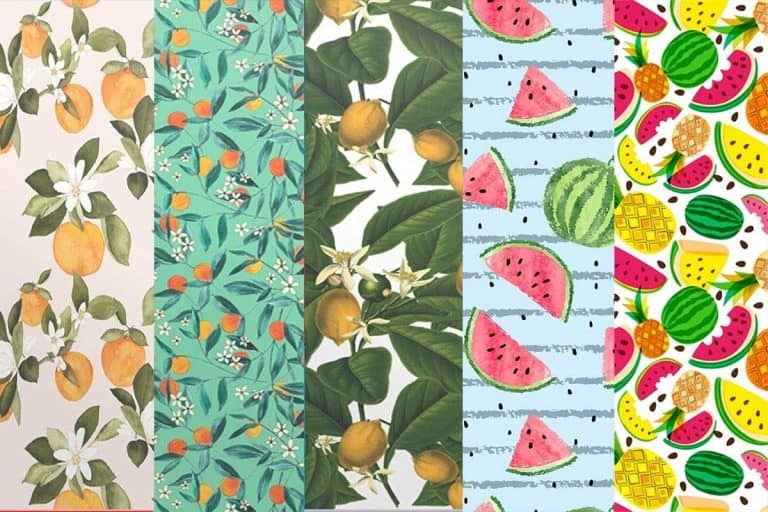 And remember, you need to feel good in your own home and kitchen, so get inspired and design it just how you like it to be.